No, you are not seeing double. After more than nine months of leader-ender piecing, with a hard push at the end, I had 140 scrappy blocks ready. Originally, I thought to make a queen size quilt, which would have used 132 blocks. But, I noticed a guest bedroom that had two twin beds in it that looked like they needed quilts. 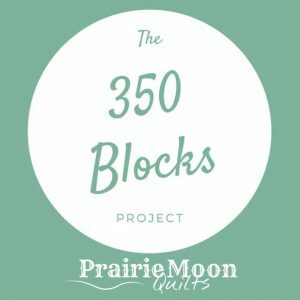 That would only take 140 blocks, and after so many, what are a few more? And, here are the assembled tops. It seemed that having the cornerstones all a single color might help to bring some order to the chaos. I chose red because that was the color I had the most of. As good a reason as any. And the truth. Special thanks to all of you that have shared your scraps with me at various times. Look close and you might recognize a few old friends. 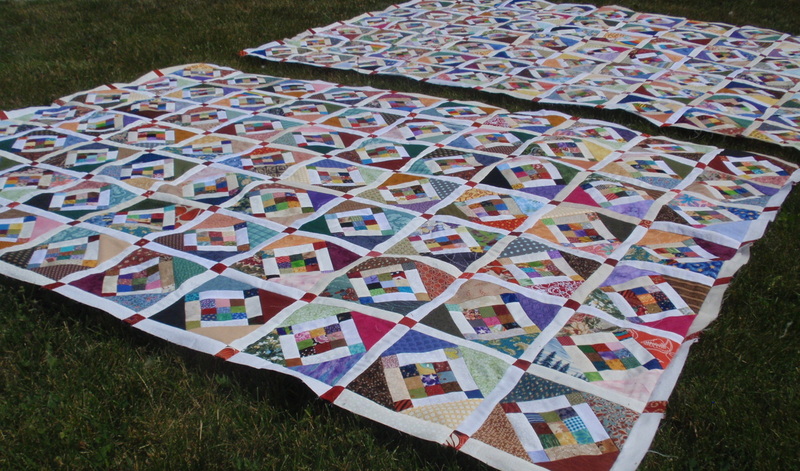 Now, I just need to choose a back and get them to the quilter. The big final decision will be a binding color. I had thought about using red there, too, but that will just bleed into the cornerstones. Blue? Brown? Black? Suggestions? 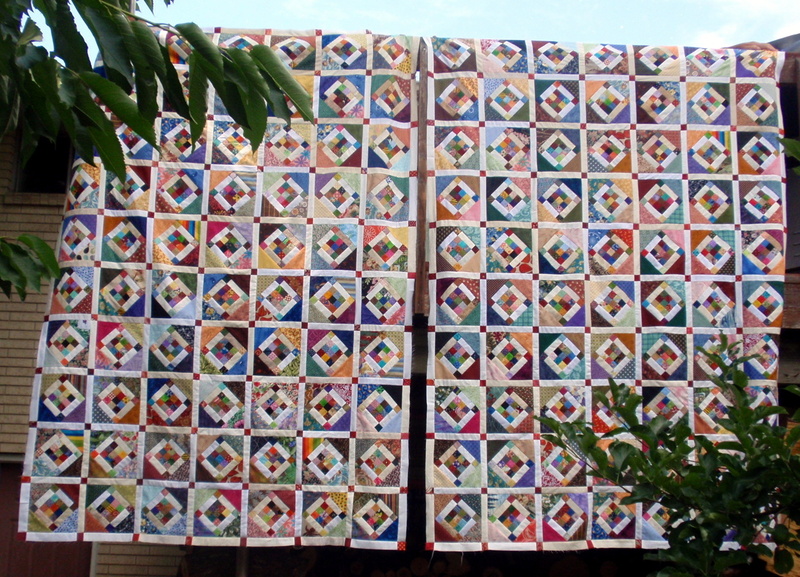 The quilts are smallish twin quilts at 57″ x 81″. But the beds are low and I think they will look OK. They are entirely scrappy. 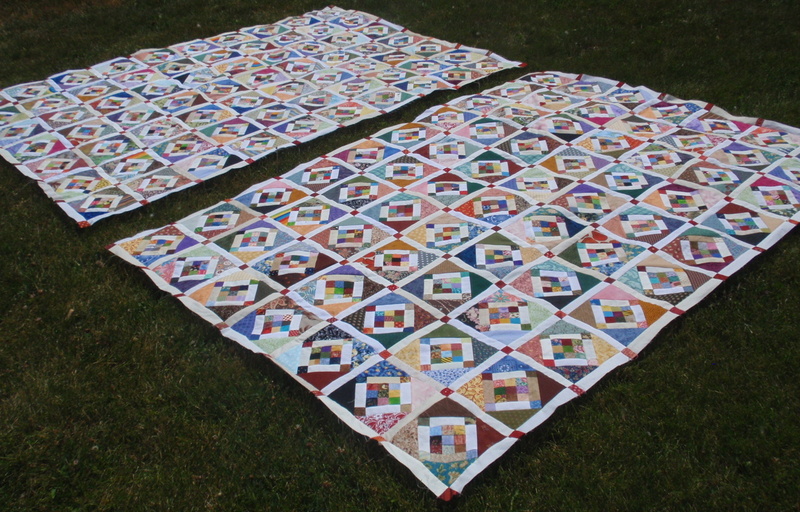 Of course, the 1-1/2″ squares were hit the hardest, with 13 in each block plus the sashing. But, the triangles and the light sashing rectangles were all cut out of scrap, too. In all the two quilts have around 14 yards of fabric in the tops. At whatever-you-pay-per-yard, that is quite a bit of fabric for “free.” Plus, how else do you get such a cheerful, homey look in a guest room. Wouldn’t you feel welcome in a room with these on the bed? 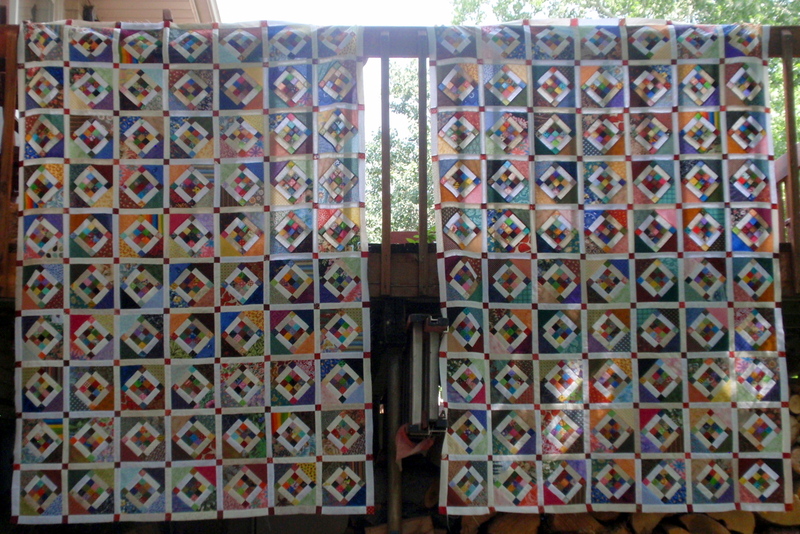 Posted on July 7, 2013 by weddingdressbluePosted in Quilts, Work in ProgressTagged leader-ender, Quilts, scraps. 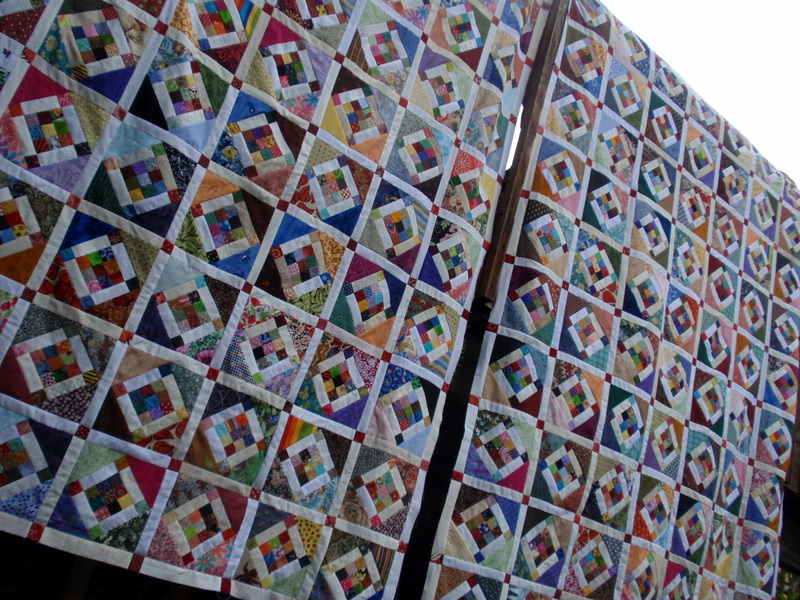 Scrappy quilts are the best, the beds will look inviting and comfy. Don’t you love looking at the quilts and remembering where each fabric came from?? I don’t think it will make a difference what color binding you use, except maybe that it should read “solid”. the two quilts look fantastic and will definitely add something to the room. Yes, I would feel very welcome! I thought about blue first, but would that seem sort of patriotic? Any chance of making a scrappy strip binding of various lengths that are lying around? That way, you could have shorter red strips here and there that didn’t run into the squares. Otherwise … deep gold? Love them, I would love to curl under one of them. Great job. Darn, I checked my guest room, and I don’t have two twin beds, so I guess they’re not for me! beautiful job, Deanna. Holy smokes! That is so amazing! sure does make me want to get back on these blocks!!! i took a bit of a break because i needed to dig out some more inner sashing bits….but i don’t even have enough of the inner 9 patches done yet for my quilt. i am definitely going to get back to stitching them though after seeing your little beauties!!! i am in agreement with the scrappy binding, or a gold. would be great!!! love them..again I will be glad when I can get back at mine..i did get a few blocks done awhile back..i like gold too for the border but I also like a print on print and not a solid..very pretty…would make a welcoming room to stay in..
Oh, Pat, I am sorry to have neglected that detail. You can find links in this post: https://weddingdressblue.wordpress.com/2013/06/29/one-hundred-forty/ Enjoy! They look so warm and cuddly! You did a wonderful job on them. I think a black binding would frame them both nicely. I do have twin beds that hubby’s grandfather made. One is in daughter’s room and the other in the guest room. They both have quilts, so I am good. Love how they turned out. I do imagine those who sleep under them will also sit and look at both and try and find similar fabrics on both quilts. My mother made quilts for many of the little great nieces and nephews, and they all share a lot of the same fabrics. They love to point out the same fabrics in the other quilts as are in their own. Deanna – Those quilts turned out so great!! And what a fun room the quest bedroom will be to walk into!! I think a scappy binding, maybe every 12 inches would be darling!! Applause! What is it about a scrappy quilt that just makes my heart sing? This is such a pretty pattern and I can only imagine what a beautiful addition they will be to any room. These both look fabulous! You have great perseverance. cheers on the finished top–and love the result! I agree about red cornerstones. Mine languish at the 9-patch stage–their day is coming soon though. Since I’ve been gone a while, you probably have them bound by now. I like the scrappy binding suggestion too. They are beautiful. I like the way you think about fabric! What about royal blue for the binding? It’s gender neutral and a bit more colourful than black or brown. Oh my busy friend! These two will be amazing no matter where they land. Two IS better than one!